As the sunset colors adorn the sky over Lake Audy in Riding Mountain National Park in Manitoba, Canada, some people arriving in a camper get set up at their lakeshore campsite. Brilliant hues of pink, yellow and orange highlight the sky at sunset silhouetting the trees bordering Lake Audy in Riding Mountain National Park in Manitoba, Canada. The sunset colors reflect off the glass like surface of Lake Audy as people arriving in a camper set up their campsite for the evening. 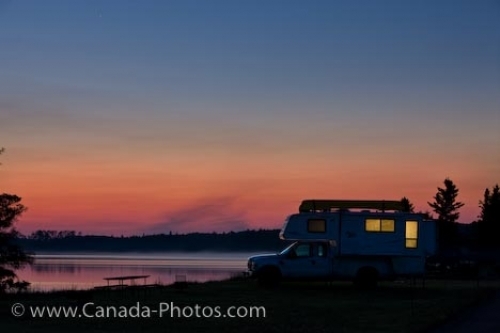 The yellow glow from the interior camper lights provide ample light for these tourists who can relax along the shore of Lake Audy and watch Mother Nature light up the sky at sunset. Many of the campsites are situated along the lakeshore making it easy to launch a canoe, swim and travel back and forth to the camper for necessities all surrounded by the peacefulness of Riding Mountain National Park. Tenters at Lake Audy may find this campground a little primitive as the luxuries are very limited, but people traveling in a camper have everything they need. The campground is open from the middle of May until the middle of October where fishing, boating, swimming and photography become the main activities while at Lake Audy. Picture of the glow of the lights of a camper at the Lake Audy Campground in Riding Mountain National Park, Manitoba at sunset. Camper at the Lake Audy campground during sunset, Riding Mountain National Park, Manitoba, Canada.